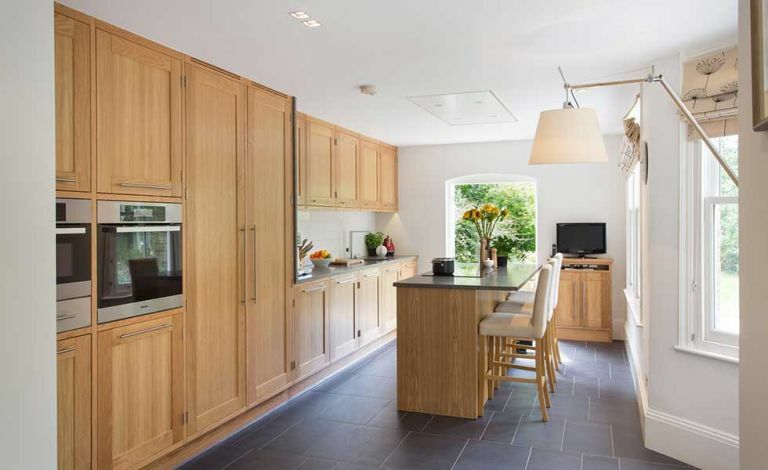 Finding the right designer for a new kitchen design, whether a specialist kitchen designer, joiner, architect or interior designer, is imperative to a successful result that suits your needs and lifestyle. Follow architect Hugo Tugman’s advice on which questions to ask before committing to a professional. 1. How can you help me realise my vision for the whole space? This should be the first question you ask, as many kitchen designers will think about the look of the kitchen units before addressing how this will relate to the rest of the room – particularly important if you’re planning a new open-plan kitchen. A well-thought-out design will address how the kitchen fits into its space and connects with the rest of the home – it’s a quality to make or break any kitchen design. 2. What services can you offer me? It is always important to have clarity about what you will (and will not) get for your money with a professional designer and this is best encapsulated in some form of written contract. Ask the designer what they can do for you, for example – will they do all technical, dimensional drawings, work with contractors if need be or consult on the interior design fixtures and fittings once the design and layout has been finalised. Most designers offer options for a consultation-only basis or an all-round service, so you can tailor how little or how much involvement you’d like them to have. Before you commit, it's worth knowing your rights when buying a kitchen. 3. Have you worked on a project like mine before? While qualifications such as a university degree can be an indicator that a designer is fully qualified, there are plenty of highly qualified professional designers who are frankly not up to much and there are also many unqualified designers who are very capable and can provide an excellent service. Always endeavour to find out what types of projects a prospective designer has worked on before and ask to see pictures or references from previous clients. Go and see previous kitchen projects if possible. If a designer has worked on a project that is of similar scale and nature to yours, it’s a good indicator of their skill set. 4. In what order should I expect the work to be carried out? When designing a kitchen, I would always encourage starting with the ‘big picture’. How does the kitchen sit within the home? How will you move in and out and through the kitchen? Get the space right before starting to focus in on the style of door-front or choice of worktop. As the design process progresses, the designer will close in on the detail gradually, working through the ergonomic issues, lighting, materials and certainly focus should arrive in due course on every detail such as the layout of cutlery drawers and number of power-points. The drawings that come out of this process should reflect this sequence. Initial layouts will be fairly diagrammatic and pictorial, with detailed drawings appearing at the end of the process, covered in dimensions and specification notes. 5. How much should I expect to pay a kitchen designer? This will depend tremendously on how intensively you want the designer to work with you, but it is always important to ask about costs for their service and how they can help you stay within your kitchen budget. For a consultation that culminates in an outline layout design, expect to pay a few hundred pounds, whereas an in-depth process culminating in fully detailed set of drawings will often require a fee of 10 to 12 per cent of the cost of the kitchen. Expect most kitchen companies to include the cost of the kitchen design within the overall price. Be as clear as you can be about what you hope to achieve. It does not matter whether this is very specific or quite vague, but don’t hide anything from the process. Seek out unbiased advice from an independent architect or designer rather than incurring the hidden costs of a so-called ‘free’ design service from a kitchen supplier. Be open-minded to suggestions and prepared to say exactly what you think in equal measure. Road test a potential designer. Ask them to undertake a design exercise for a fee (around £720). It will see if you work well together and if not you may still get a few design ideas from it. Don’t forget to ask about qualifications. Ask to see accreditations from bodies such as KBSA (Kitchen Bathroom Bedroom Specialists Association) and IKKBI (Institute of Kitchen, Bedroom & Bathroom Installers). Try and be involved in the design process and be sure to get a clear set of drawings with dimensions from your designer.